The Apple TV is a great living room accessory, but many with media center and home theater PC experience prefer more powerful apps like Plex and XBMC for their additional features and broader video codec support. With XBMC you can play almost any video or audio format, access shared network drives for network playback, accept media streams from a LAN or the internet, install new user themes (skins), display weather and news information, and basically serve as a full fledged multimedia jukebox. Thanks to the wonderful world of jailbreaking, you can now install the excellent free XBMC software on an Apple TV 2 running 5.2 (Apple TV 5.2 software shipped alongside iOS 6.1 for other idevices) and help to unleash the devices full potential as a home theater device. Getting it all up and running is slightly more complicated than your average jailbroken app installation process because there’s no Cydia, and you’ll be required to SSH into the ATV and then use a package manager to retrieve and install the appropriate XBMC files. But it’s really not too complicated, so follow along and you’ll be able to get it done in short order. Unfortunately, the Apple TV 3rd generation is not yet jailbroken and thus can not accept an installation of XBMC. Jailbreaking an Apple TV with Seas0nPass is very easy and fairly similar to the Evasi0n tool for mobile iOS devices, you’ll need to physically connect the Apple TV to a computer to perform the jailbreak. With base requirements met, you are ready to proceed. Apple TV will reboot and you will know Seas0nPass has been effectively installed because the Settings icon on the Apple TV home screen is temporarily replaced with a red “FC” logo. Now for the good part, installing XBMC. The default password for Apple TV is “alpine” without the quotes, just like all iPads, iPhones, and iPods. It will be “alpine” unless you changed it at some point. Now that you are logged into the Apple TV remotely, the installation process begins. The official method from XBMC outlined below uses the command line, though the XBMC Wiki offers an alternate method if you’re adventurous. 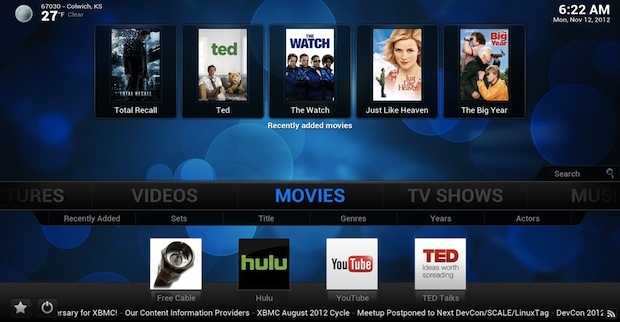 The Apple TV will reboot and you’ll now have the lovely XBMC media center app running on it. Alternatively, you can unzip skins and plugins on the computer then use scp or SFTP to copy them directly into their appropriate plugin or skin directories. Skins can look really great and are free to download from XBMC. Confluence is a great looking subtle skin that became the default, and AEON is a popular third party choice, though it hasn’t been updated in quite some time. The Apple TV2 will reboot without XBMC. Uninstalling XBMC does not undo the jailbreak on the Apple TV. If you want to unjailbreak the Apple TV, you would need to connect it to iTunes running on a computer, and use the “Restore” feature to return it to factory settings. For some history, XBMC is short for “Xbox Media Center”, yes, Xbox, as in the Microsoft game console. 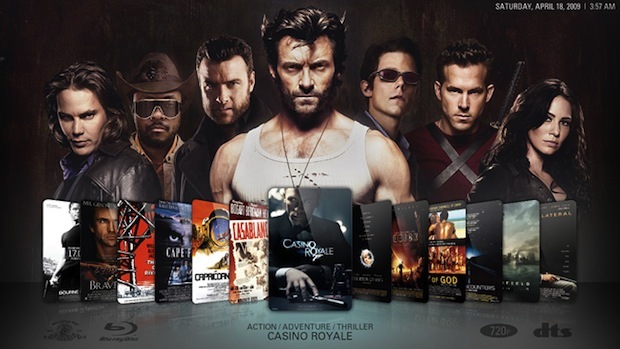 XBMC was originally built for modded xboxes to turn them into media centers, but it has since evolved into a cross-platform compatible media center app that runs directly on top of just about anything, from Mac and Windows computers to the Raspberry Pi. 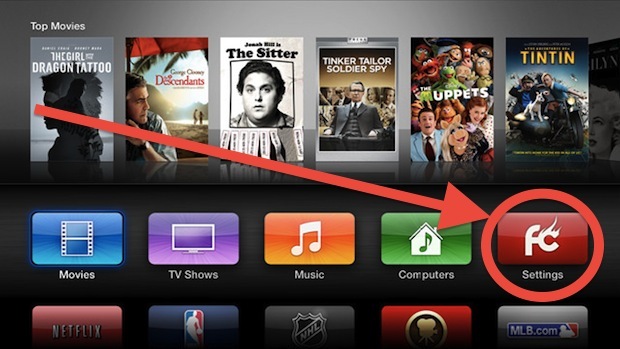 The latest versions of XBMC include support to function as AirPlay receivers both for streaming video and audio from iTunes, so you won’t lose those iOS designed features by using XBMC, but unlike Apple TV’s default software, it can flawlessly play mkv files directly on the ATV (or desktop) without struggling. XBMC has been able to run on jailbroken Apple TV’s for a while, but this is the first time it’s been available on the latest 5.2 software update. Ahh wish someone would jailbrake the 3 soon. I’ve done this mainly to use Amazon Prime streaming (via a 3rd-party plug-in). It works moderately well. One thing I would like to know is if the new XBMC audio engine will enable streaming of music that has a higher sampling frequency than 48KHz. Anyone have that working? I was told last week that if you upgrade to 6.1 and then JB your ATV2 that XBMC will not work. That for me is the only reason TO Jailbreak. Are you positive this new info is correct. I don’t want to lose XBMC. Can you still use itunes ?